Where is that cat, and what did he do with my tongue? So as we were eating dinner tonight, there were a lot of clever phrases running through my mind I could use in this post. Then the littlest tilted the dining room chair over while trying to whisper something in my ear and she went with it. Her fall was almost broken when she caught her chin on the table, biting her tongue in the process. There is nothing worse than your child virtually slipping through your fingers and getting hurt. Except maybe that terrifying couple of seconds of silent scream where she holds her breath...it actually took her four of five little hiccups before the blood-curdling scream, it felt like forever! She is fine, I still need a good cry about it. This is what was for dinner: rosemary pork chops, roasted cauliflower, crunchy (raw) carrots, and fried apples. I didn't take a lot of pictures this time, as I didn't think about posting until the apples, which were an afterthought. The rosemary pork chops was a recipe on the side of the Shake and Bake box. Kraft Brands--shake-n-bake recipes We've always loved the shaking and the baking, but when you add some Dijon mustard and rosemary, yum! Check out the size of these things--I got a big pack at the store for a ridiculous price and these three were buried under four more chops the size of my whole hand. All seven cost me about eight bucks, what a deal. We always cook the shake and bake on a rack sprayed with cooking spray on a foil lined baking sheet--it gets a little crispier that way. The cauliflower was tossed with olive oil and kosher salt and roasted for about 20 minutes at 425 degrees. The littlest used to eat it (she used to get mad if you didn't let her have the whole bowl), but it's been awhile and she's in the "I won't eat any part of the food that is brown" phase. When she told me she didn't want the brown parts, her sister reminded her that "brown food tastes good." Combine all ingredients in a small skillet. Cook over medium heat until sugar is dissolved and apples have softened a bit, about 5 minutes. After tasting, the littlest said "maybe I think I don't like them." The biggest ate a few and said "maybe I can have some more apples for dessert." We made another batch with enough for her to take some for lunch tomorrow. By the way, when your husband uses a metal fork to cook the apples, and then you use said fork to scoop them into a lunch container, DON'T LICK THE FORK! It's hot. Charleigh wasn't the only one sucking on an ice cube tonight. A friend invited us and another family to go to an indoor play area at a local library. I've been wanting to check it out, so we decided to go. Closed. Presidents' Day. Fly by the seat of your pants, straight to the play place at the local mall that has a couple of bouncy houses. Follow that up with a picnic of Chick-fil-a and a good long round of freeze tag in the center of the mall "amphitheater." Not ready to call it a day? Let's try some bowling! Ten-pin! With a 2 year old, a 3 year old, two 4 year olds and two 5 year olds. Thank goodness for gutter bumpers and a very patient ball-fetcher manager who would stroll out and return all the balls that stopped rolling half way down the alley. What a great day we had (she said without even a hint of sarcasm)! Home by 4:00 with the intention of cuddling on the couch with a movie, as we missed nap time. No movie...I started clearing the dining room table (we are terrible about leaving mail on the table and not doing breakfast dishes in the morning) when the littlest brought me a silicone ice cube tray shaped like apples and asked "can we make something in this?" Fly by the seat of your pants--of course we can! Which led to this...I've been wanting to make it since I pinned it on pinterest. jello mosaic dessert bars It is three flavors of jello jigglers mixed with a unflavored gelatin and sweetened condensed milk mixture. It is pretty and pretty yummy, I got to use my mother's old Tupperware jello mold, and you can eat it with your fingers! I really love the look of it, and I can't wait til St Pat's day--rainbow colors!! While the jello was setting up, I did these (as a Valentine's gift for my teachers...okay, as Presidents' Day gift, I'm a bit behind. They are lip balm holder key chains. I put them in a clear bag with some Hershey Kisses and a tag that said "Pucker Up Buttercup"). I'll give credit here www.littlebitfunky.com chapstick cozy but I didn't really follow their directions implicitly...a little more flying by the seat of my pants today. Then it was dinner time. I had reached my daily quota of domesticallity. We had Canna-Box for dinner. Allow me to explain. My friend Jen coined the term a few weekends ago. She had a dinner party for six adults and twelve children at her house. She was very proud of the sweet potato casserole she made from scratch, and joked about how the rest of dinner was "Canna-box." With that many people to feed, and most of them kids, she had bought rotisserie chickens, instant mashed potatoes, boxed stuffing and, of course green bean casserole. Sometimes I think that because I wrote a cook book, and I love to cook, people think that I scratch make all of our meals. Soooo not true. Egg (over hard for me), cheddar cheese, and sweet Lebanon bologna on an English muffin. Hmm, next time I'll use Swiss cheese and call it an International Hand Warmer! So Jen, no worries, even the best of us canna-box it every once in awhile. Let's Get Ready To GUMBOOOOOO! I found this great recipe for gumbo at Bacon, Butter, Cheese, Garlic (what a fantastic name!). And the title of the blog post is "The Rue to Roux." How can a girl named Roo not give this recipe a shot? Normally, I hate it when people post another person's recipe and then say "but we used turkey instead of pork, added some ketchup because I really don't like the flavor of mustard (in the mustard pork chops), and omitted what ever other ingredient that is essential to the recipe because we feel like it." So I really try not to do that the first time I make a recipe. But I will tell you that we didn't make the shrimp stock--we have two small children and not a lot of time. I used chicken stock we had on hand, so we added the creole seasoning with the chicken while it was cooking. Also, after a little distraction named Danielle, I didn't refer back to the recipe and I assumed that the time to add the tomato paste would be after cooking the chicken and sausage. The recipe says to add it with the shrimp near the end. Turned out fine. 1 cup vegetable oil and 1 1/4 cup flour. Whisk in a stock pot and stir constantly until the roux is caramel colored. We are getting there...it took about 20 minutes for us, and in hindsight it could have gone a bit longer...gotten a bit darker. Chicken (and creole seasoning--Emeril's, made from the link in the post on Bacon Butter Garlic Cheese). Andouille sausage. I was halfway through slicing when I said to the hubby "should I dice this?' So some is sliced and some is diced. Here is where I stirred in the tomato paste...this looks good enough to eat already! Add the mixture to the roux--carefully, it really bubbles up at first. Sorry, not enough hands to take a picture. Then add stock and bring to a boil. Add okra and cook to your liking. We let it go about 20 or 30 minutes. Long enough to tickle the children for awhile. We pulled about half the recipe out to freeze before adding the shrimp to what we are going to eat today. I'm sure that you could also freeze the shrimp, but the hubby has a thing about (not) eating leftover shrimp. The shrimp cooked way quicker than I expected, so check it often. Ladle some gumbo in a bowl and top it with a scoop of rice. Delicious! Hubby needed a little more heat so he added some hot sauce. Next time, we will make the stock--I think that is where we'd get more kick. Also, next time, I'm getting him to take the pictures. Let me tell you what a joy it is to try to take pictures on a point-and-shoot camera with your photographer husband behind you. I can only assume that the eye rolling and brow lifting were meant to be pointers. Today was a snow day! The snow gods dumped about a foot of heavy snow overnight. And for the first time, I didn't spend the day second-guessing my decision to close Grannie Annie's today. Also, for the first time, I made the decision last night...I got to sleep in (relatively speaking) and just be a mom this snow day! After a super long cuddle in bed this morning, I asked the littlest what she wanted for breakfast--anything she wanted. She asked for pancakes with sprinkles like I made for her sister's birthday. Absolutely! 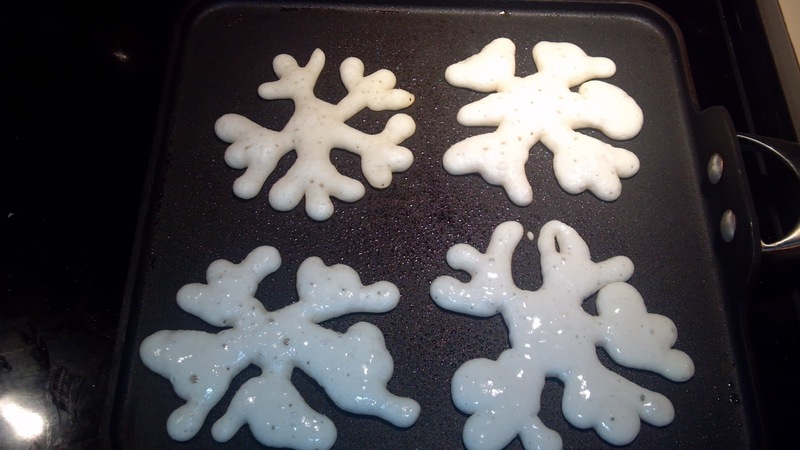 Hubby, on his way out to shovel (for the first time) said "it's snowing, I want snowflake pancakes." Challenge. Accepted. Looks fancy, it's super easy! I use this technique just about every other time I make pancakes. It's instant pancake mix, the kind you just add water. Mix it, let it stand for a few minutes (it will "rise" a bit), then pour it into a squirt bottle. I have one with a wide screw off top that I think came in a chocolate melting / candy making kit. You can use an old ketchup bottle or syrup bottle, but it's not quite as easy to fill. I imagine you could use a pastry bag with a large tip, or in a pinch a zip top bag with the corner snipped off, but I haven't tried either. The upper left one was the first, and neatest. The rest were done in a hurry as the pan was getting hot pretty fast, but you get the idea. So in the finished product, I added a drizzle of syrup and some snowflake sprinkles (that I got dirt-cheap on Christmas clearance a few weeks ago and the kids have been itching to use). When we sat down to breakfast, I may or may not have triumphantly said to my husband "Ha. 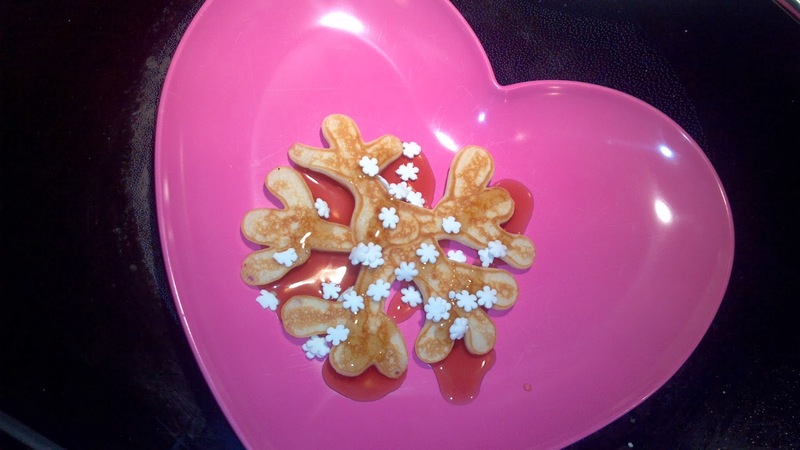 snowflake pancakes with sprinkles!" So it started because the kids were home sick. Day one was doctor appointments and bed. Day two was four movies and a nap (quite an accomplishment for the three year old--she really wasn't feeling well). Day three my wonderful business partner came in on her day off so I could give the kids one more day at home to drive me bananas recuperate. I know they are starting to feel better, despite the icky cough, because they are eating non-stop and actually playing today. After two snow days last week and three sick days this week, I am desperate for distractions. Baby Girl: What is that paper made of? Me: What is this coupon holder made of? Me: What is this piggy bank made of? Me: What do you think it's made of? So after some Lucky Charms, she wanted to know what marshmallows were made of. We looked up a recipe (Thank you Mr. Alton Brown *love you* and the Food Network), and here is what happened. For some unknown reason, when I moved into my husband's house almost a decade ago, he had a giant box of unflavored gelatin. Because of that, we had all of the ingredients to make marshmallows. I forgot to put the vanilla in the picture, but you get a bonus photo bomb! 1/2 cup water, 1 1/2 cup sugar, 1 cup corn syrup heated to 240 degrees. The last 10 degrees feels like forever! 3 envelopes of unflavored gelatin softened in 1/2 cup of ice cold water. Mix the heated sugar mixture into the gelatin at low speed until combined. Let the children find something else to do when you lose their attention. Whip it for longer than you think (12-15 minutes in a stand mixer if you have one), until it gets thick and lukewarm. Add 1 tsp vanilla in the last minute of whipping. Don't forget to call the children back every few minutes to see it get thick. Pour into a pan greased and dusted with a cornstarch / powdered sugar mixture. Spread with a greased spatula. Dust the top with more cornstarch / powdered sugar. Let sit 4 hours or overnight. Turn out onto a cutting board and cut with a pizza cutter dusted with the cornstarch / powdered sugar mixture. Toss the cut pieces with rest of the cornstarch / powdered sugar mixture in a zip top bag, shake off excess and store in an airtight container. My hubby says these taste better than store-bought. The children say they don't look like the ones from the store...bonus math lesson: Marshmallows are cylindrical in shape. Update 2/13/14: Made the marshmallows again today, Cherry flavor by request. We added a pack of cherry Kool-aid powder (the kind that you add sugar to, but don't add any sugar to it) to the 1/2 cup ice cold water before mixing in the unflavored gelatin. They are delicious, as long as you like cherry kool-aid. Very cherry flavored. We are going to try to root beer flavored next (root beer extract in place of...or in addition to...the vanilla extract).